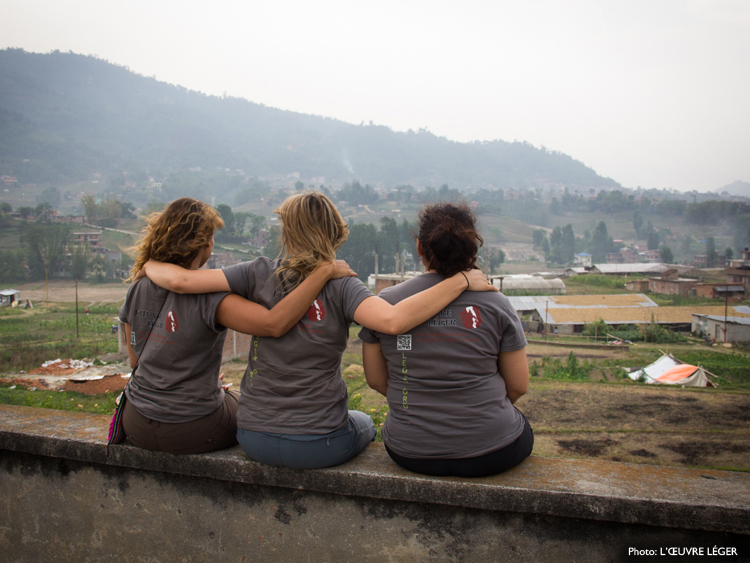 LÉGER FOUNDATION volunteers Marie-Faye Galarneau and Shannon Kelly just returned from their mission in Nepal, where they managed to make a difference for the victims of the earthquake that shook the country. They return with lasting memories and a growing interest in humanitarian aid. Child Friendly Spaces (CFS) that they helped build with NGOs on the ground are greatly appreciated by young Nepalese, and are always in effervescence. Children can make friends, feel confident with qualified counselors, participate in guided activities and just play. Besides, Marie-Faye had brought soccer balls as gifts and played a few games with the kids. The services provided in Child Friendly Spaces are critical in the current context of Nepal, because children have no routine or references. With CFS, they find a safe and familiar place where they forget their insecurities and can play in peace. Conseillors also organize activities to encourage children to express their emotions in a non-formal setting. Until now, sixteen (16) spaces have been built by the LÉGER FOUNDATION in various villages of Nepal, but others may follow. Our local coordinator, Bandita Thapa, is working hard to ensure that as many children as possible have access to these services. Your donations will go to help earthquake survivors. Give generously!